This the long-awaited follow-up to The War of Art is another push I needed at the right time. 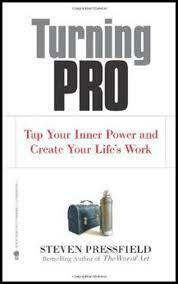 Pressfield wrote: “Turning Pro is free, but it’s not easy. When we turn pro, we give up a life that we may have become extremely comfortable with. We give up a self that we have come to identify with and to call our own. Turning Pro is free, but it demands sacrifice." If you’ve been working at finding your voice and embracing who you were meant to be, then you owe it to yourself to read this book and go to the next level.